May 20, Moline, IL. 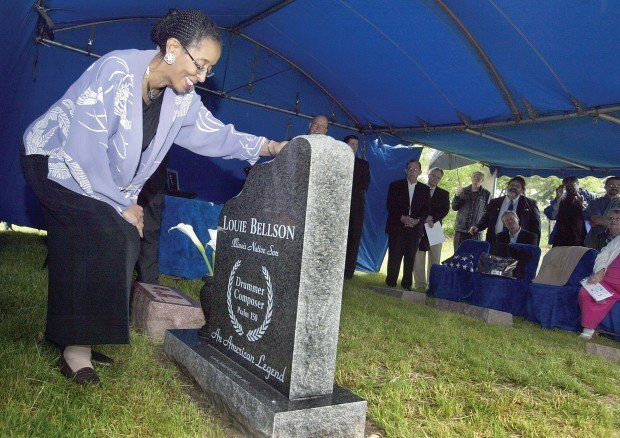 Despite Mrs. B's tornado-delayed plane, (some) attendees' hours-long drive in the rain from all over Illinois, not to mention the constant rain during the entire ceremony, stalwart fans could not be deterred from expressing their respect for Louie Bellson at the official unveiling of the headstone monument by designer Mrs. B. 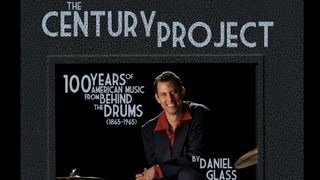 Guests included family, friends, clergy; Ill. state Rep.; former Mayor of Rock Falls (Bellson's birth city); Chicago Deputy Sheriff; Author of upcoming book on Italians in Jazz; RME Museum Director; Educators; Drummers from Symphony and Jazz. (Shown above: backside of stone. Shown below: frontside of stone). WQAD-TV News story on May 20, 2010. Unveiling of the Louie Bellson Monument in his boyhood home and final resting place of Moline, Illinois (Quad-Cities). and Quad-Cities Times photographer John Schultz. Click links below for articles and more photos. 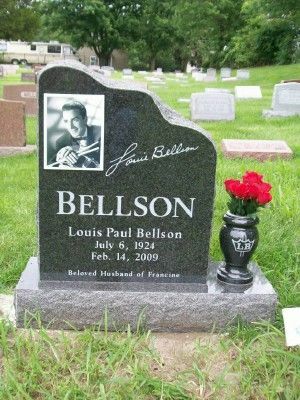 May 16, Quad-City Times, "Bellson's widow keeping his musical legacy alive"
May 20, Moline Dispatch, "Bellson beat goes on"
May 21, Quad-City Times, "Family, friends memorialize jazz great"
May 21, Moline Dispatch, "Honoring a Legend"